I love browsing through second-hand book shops, charity shops, and jumble sales, looking for old maps. They say one man’s trash is another man’s treasure and you can often pick up some real gems for just a few pence. Some of the most interesting maps in my collection are just “throwaway” maps, produced by tourist boards, petrol stations, shopping centres, or, in this case, banks. 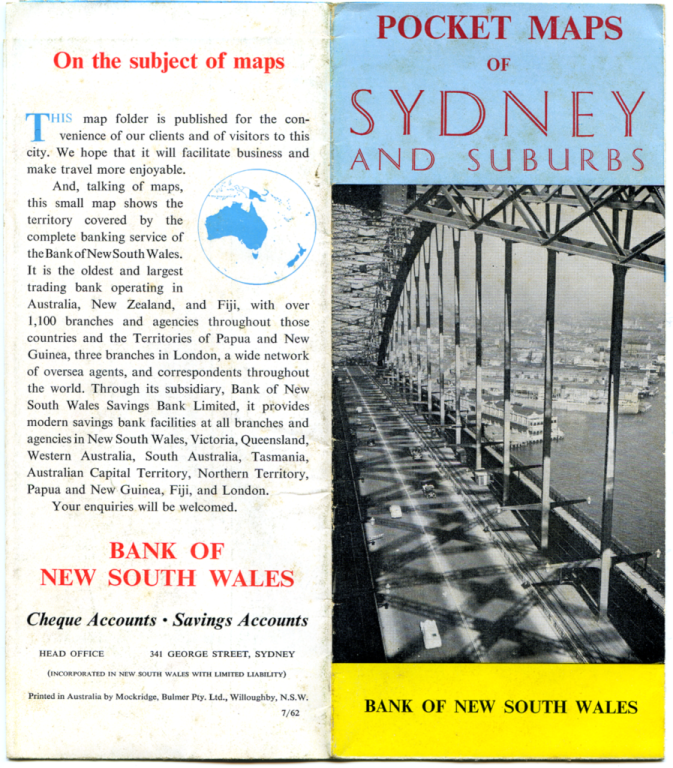 The Bank of New South Wales produced this lovely pocket map of Sydney and suburbs, with a bit of local history, public amenities, bank branch locations (very important, obviously), and interesting cartography thrown in. 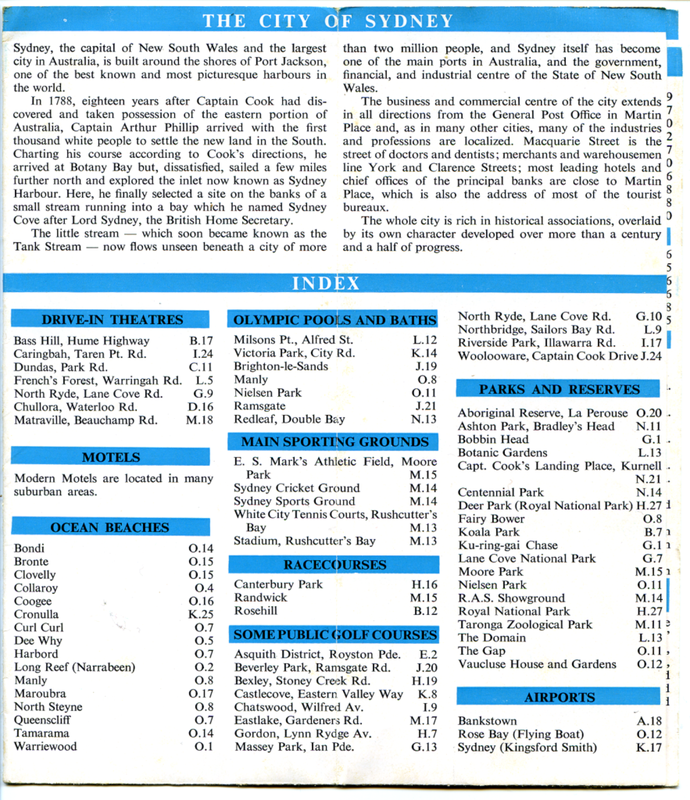 Turning it over shows a short history of Sydney and part of the index. Perhaps the cartographer was not aware this section was being added to the map, because the Tank Stream isn’t marked – I couldn’t find it at least. It would have been nice to know whereabouts in the bay the city was founded. 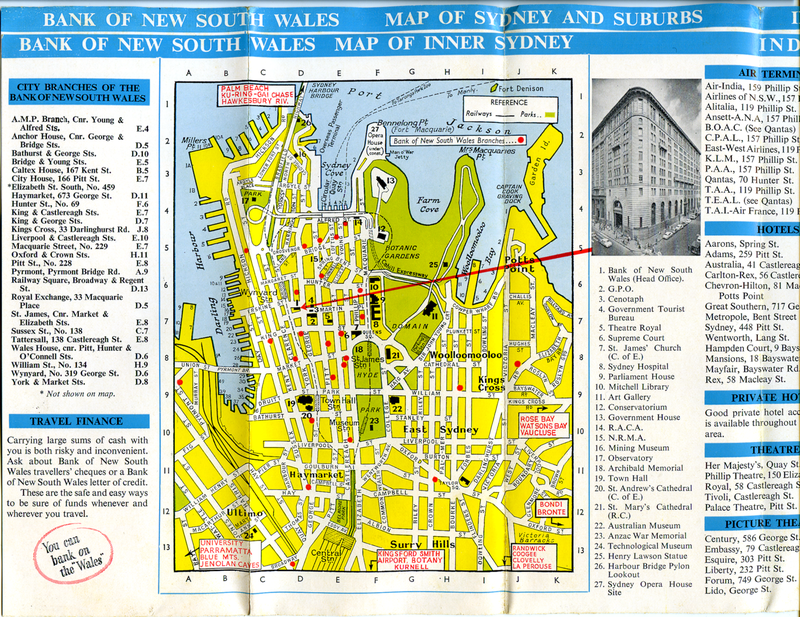 Inside is a detailed map of the city centre, with area and street names, important buildings with key numbers to labels in the legend, and so on. 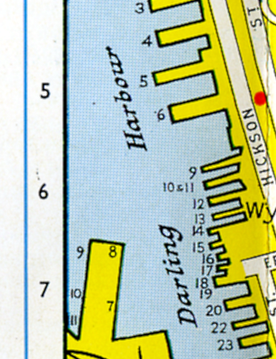 Grid references are provided, but the lines are left out so the map does not appear too cluttered. I like the fact that you can tell this map is hand-made. The text size and shape is ever so slightly inconsistent, and there are one or two omissions. Perfection is overrated though, in my view – it’s like buying a loaf of bread from your local baker, rather than a plastic-wrapped plastic loaf from the supermarket. There are a number of interesting details, most of which could be easily reproduced in a modern GIS package, but must have taken some time to draw correctly. 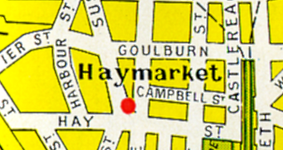 In the examples below, the road casings are the same colour as the Haymarket label, so they have been split around it (1). Some names have been abbreviated – to show this has taken place, the last letter(s) of the word are in superscript, with a dot placed underneath(2). 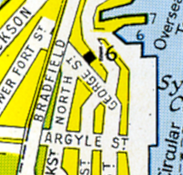 In the third example, Wattle St has been hyphenated to fit around the Macarthur St label. I haven’t seen this kind of fitting strategy before – presumably it’s not a a very popular solution. 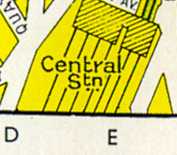 All the street labels on the map are written in the same direction (bottom – top or left – right), so streets such as George St have been labelled upside down (4). I think there is a mistake on Haig Av – the ‘v’ is full size and the dot is to the right, instead of underneath it (5). In example (6), the text is drawn smaller to fit into the street feature. A different font was used for the water feature names (7) – a chance for the cartographer to try out some different handwriting perhaps? 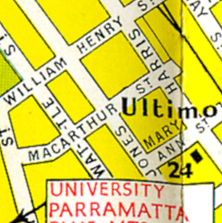 And finally, a clue to when the map was produced. The famous Opera House was under construction between 1957 and 1973. If you look back at the front cover, there is in fact a small ‘7/62’ in the bottom corner, which may have been some kind of reference number, but is more likely to be a date. Finally, a quick look at the suburbs section of the map – there aren’t so many interesting details here, although you do get a sense of the size of the city. It has indexes either side showing bank branches (again!) 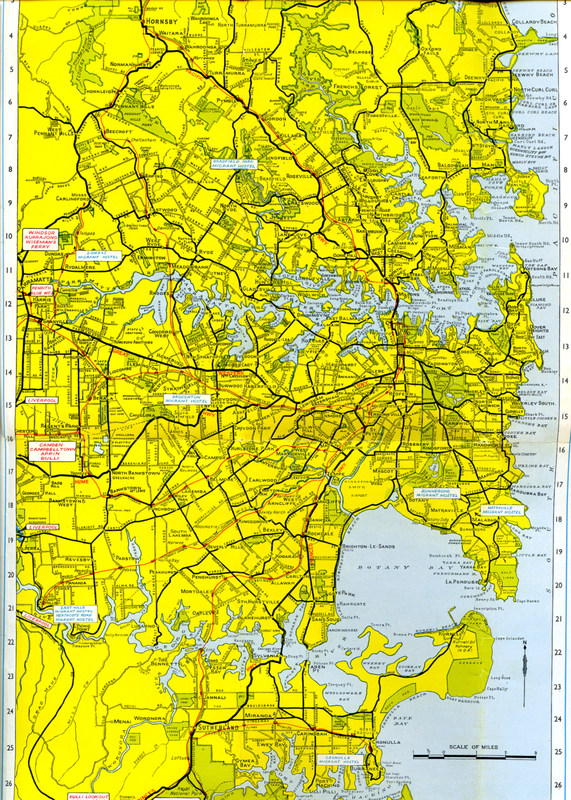 and suburb names, but it is slightly too big for my scanner, so just the map is shown here.